Four Stars in HS & La Lirio LIVE! Helsingin Sanomat gave us four stars in their review! (That’s the largest newspaper in the Nordic countries, for you who were wondering.) They also said it’s a pity that you probably won’t hear our songs on the radio. We fully agree. Poor, poor radio, what is this illness that makes our heartwarming ballads too strange and wild for you? And while we’re on the subject of ballads, we promised something yesterday – a song fresh from the album release concert for those you who couldn’t make it! Special thanks belong to our two brothers who filmed us, Roy Boswell who saved us from having to operate the lights ourselves (and look at all the beautiful drama he’s creating here!) – and, as always, our Dandy-Daddy Juha Reunanen for the sounds and everything else besides. Oh, and we heard that a certain someone arranged a Film Noir get-together in Scotland to celebrate our album release. What a Super Sweetheart, this one’s for you! Happy New Year, Sweethearts! It’s 2015, and it’s almost two years since we released Mascot Moth. During those two years we’ve played around Europe and Finland, arranged an all-night concert with video projections and performance art at one of Helsinki’s most established venues, grown together as a band and, as a result, written and recorded a new album. Where 2014 was mostly about planning and executing the Savoy gig (spring) and putting together the new album (autumn), this year’s gonna be all about playing gigs again! Although we’ve played a lot of shows and private functions during the last few years, with wonderful bands and for wonderful people, there’s only been a handful of concerts we’ve arranged by and for ourselves. Those have been the ones with aerial hoops and jazz dance lessons and burlesque and cocktails and cabaret and stuff. Those are the gigs we want to make! And the new album, Is This Casablanca?, is just full of stories and film noir and cabaret just waiting to be played out and acted on stage. It will all start with the album release party in February. We just love doing this! The above being said, we also love just getting intimate as a duo, and playing obvious and not so obvious cover songs for great crowds! So, as a Swedish gentleman once put it, “More is more!“. We’ll definitely focus on doing Shows – yes, with a capital S – at nice locations (with the lovely performer in the above picture!) for you, but there’s always great bands to play with and great venues to spend lovely evenings at, and we absolutely can’t say no to that! Our first gig of the year is on January 9th at Semifinal, Helsinki, with the amazing Valo. We’re really happy to play with them, and a little scared too, because their vocalist actually sometimes gives us singing lessons. For me it’s just an evening with two absolutely superb singers backed by two absolutely wonderful bands on the same stage! So come see the show and hear the new songs and discover VALO, if you haven’t yet. New album, Lost in Music, Spotify & Deezer! Sweethearts! It’s Sextili, or Fructidor, or August if you wish, the month of the Poppy, the birthmonth of Leo (Laura) and Virgo (Jere). It marks the transition from summer to fall, and is a common month for harvest. During the summer we’ve sown some, and now it’s time to reap! 1. We’ve started pre-production for our next album! It’s going to be wonderful! We’ll keep you posted on the twists and turns of this epic saga. 2. We’re playing at the Lost in Music festival, the biggest annual showcase festival in Finland, this October in Tampere. If you missed Kammerkabarett, or the various duo gigs we played during the summer, come and see us at Lost in Music to hear some of the new songs. You can find our producer Martiina Laaksonen and the band at Lost in Music and Musiikki & Media. We are looking for partners to work with in Europe, and most specifically a booking agency and/or distributor for Germany. We love playing in Germany, her people have always treated us kindly, the audiences have been wonderful and their feedback enthusiastic. 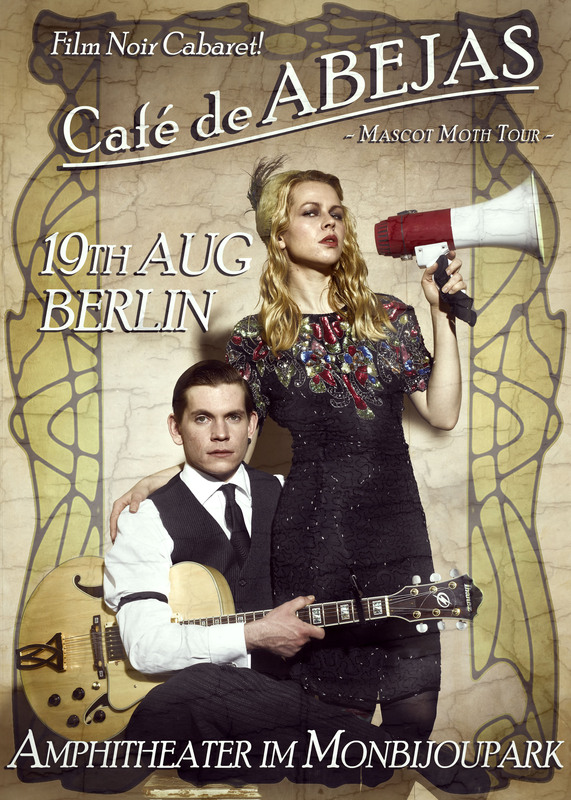 Dear German sweethearts, we want to come to you! It’s just that we are concentrating on the new album, so we simply don’t have the time and the energy to book the gigs ourselves. 3. Last but not least: You can now download ‘Mascot Moth’ from iTunes or Google Play Store, or you can stream the entire album through Spotify or Deezer. Deezer also hosts a playlist for the artists performing at Lost in Music. There are many interesting Finnish bands there, so give it a listen! Playing at Korjaamo, Helsinki, this June at Töölön juhlaviikko. Picture by Pepita Kautto. The Finnish flyer for our premiere at Savoy-teatteri in May. Short and sweet, here’s what: We’re making a show! It’s premiering in May at the Savoy Theater in Helsinki! It’s going to have an entr’acte! It’s called KAMMERKABARETT! It’s going to be romantic, and funny, and sad, and slightly surreal, and beautiful. We’re getting a trapeze, and veils, and hats and stop-motion videos onstage, and it’s all magical and fun and challenging and serious work. There are some new faces doing new things – like Noora Palotie, our Muse and my long-lost sister (that’s her up there in the hoop), her sweetheart Roy Boswell who’s in charge of technical affairs I understand very little about, his friend Luca Sirviö who designs the lighting, and Vera Schneider who has already measured the entire band for some lovely gowns and vested handsomeness. We could not be more excited. Me and Jere are constantly at work – bouncing ideas off one another and everyone around us. For my part, I’m starting to worry: Am I going to have any friends at the end of Spring? Everytime I see anyone, all my news are related to the promo video we’re planning to make, the technical difficulties our video art is facing, and how happy I am about my new KAMMERKABARETT family. I thought album making was immersive, but this is a whole new deep. Anyway, we’re soon posting pictures of our pre-production, everyone in the Helsinki area come and see our premiere at Savoy-teatteri on the 21st of May! You can buy tickets here at Lippupalvelu. Oh, and by the way: We have been increasingly active on Twitter and Instagram lately (I finally updated my iPhone), go follow us at the links! Thank you Berlin! What a great trip full of great people, wonderful audiences and uplifting experiences! We had luck on our side, too, for in spite of the weather forecast predicting a huge thunderstorm for the night of our Amphitheater concert, there was just a light spray of rain. For the first time, we presented the original Dowson poem as an intro for Cynara!, and it felt just great onstage. Now we are burning to make our show even more lush with poems, stories and theatrical elements as well as some new songs. It will be a productive winter. Time for some Berlin travel tips! For truly great American cocktail classics in suitably austere surroundings, we recommend the Redwood bar. Also, we adored the quirky museum Designpanoptikum – surreales Museum für industrielle Objekte, it’s definitely worth a visit! We have no words to describe what a pleasure this trip was, but fortunately we have plenty of pictures. Here are some of them, see more on our Facebook! It might be that we’re returning to Berlin sooner than expected, but shhh – it’s still in the making. In the meantime, we’re working hard on the visuals of a music video of a very special song – we try to make it as vivid and rich as possible, so stay tuned! The dandy band, backstage, Berlin 2013. Here is a video posted on Youtube by the lovely Sylvia Kasprzak from our April pop-up show at 12 Grad, Berlin’s prettiest Steampunk bar! We had such a lovely time there, and it shows. Berlin was so good to us we cannot wait to return to play at Aphitheater im Monbijoupark, a lovely wooden venue in the heart of the city, on 19th August! Our upcoming concert there has rekindled my dangerous obsession with amphitheatres (I used to study classical Greek,you know), and it may not be long before you start seeing the results here and on our Facebook. Not telling yet! Enjoy the sun, sweethearts, we intend to! Plenty of time for brooding in the winter, now’s the time for sea, sun and shandy.